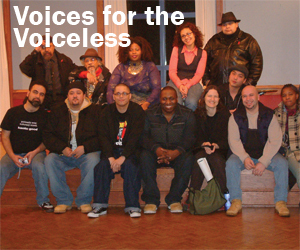 Founded by Shaggy Flores in 1995 and distributed at the annual Voices for the Voiceless Diaspora Poetry Concert™, this award honors unsung artistic heroes of the African/Latino/Asian-American/Native-American Diaspora Community. The first recipient of the award was famed African Diaspora Scholar and Writer Louis Reyes Rivera, known as the Janitor of History. In honor of his contributions to the African Diaspora, the award bears his name. Who was Louis Reyes Rivera? Louis Reyes Rivera was a professor of Pan-African, African-American, Caribbean and Puerto Rican literature and history whose essays and poems have appeared in numerous publications, including Areyto, Boletin, The City Sun, African Voices, and in five award-winning collections: In Defense of Mumia; ALOUD: Live from the Nuyorican Poets Cafe, Of Sons And Lovers, Bum Rush The Page, and his own Scattered Scripture. Known as the Janitor of History, poet/essayist Louis Reyes Rivera has been studying his craft since 1960 and teaching it since 1969. The recipient of over 20 awards, including a Lifetime Achievement Award (1995), a Special Congressional Recognition Award (1988), and the CCNY 125th Anniversary Medal (1973), Rivera has assisted in the publication of well over 200 books, including John Oliver Killens’ Great Black Russian (Wayne State U., 1989), Adal Maldonado’s Portraits of the Puerto Rican Experience (IPRUS, 1984), and Bum Rush The Page: A Def Poetry Jam (Crown Publishers, 2001). Scattered Scripture won the 1996 poetry prize from the Latin American Writers Institute. A volume of highly crafted poems of militant and radical perspective, it is a literary masterpiece that attempts to translate history into poetry, covering the chapters missing from official renditions of history. This collection took twenty years of research to create. The first poem completed for the book, “(what are they doing),” was written in 1974, and the last poem, “(like toussaint, so marti)” was written in 1995. In between came all the other works as responses to his research. Scattered Scripture contains forty-one pages of notes that provide the sources and historical context for the poems, making the book complete as a poetic song, a historical document, and an instructional device. Many consider Rivera to be a necessary bridge between the African and Latino and Latina communities.